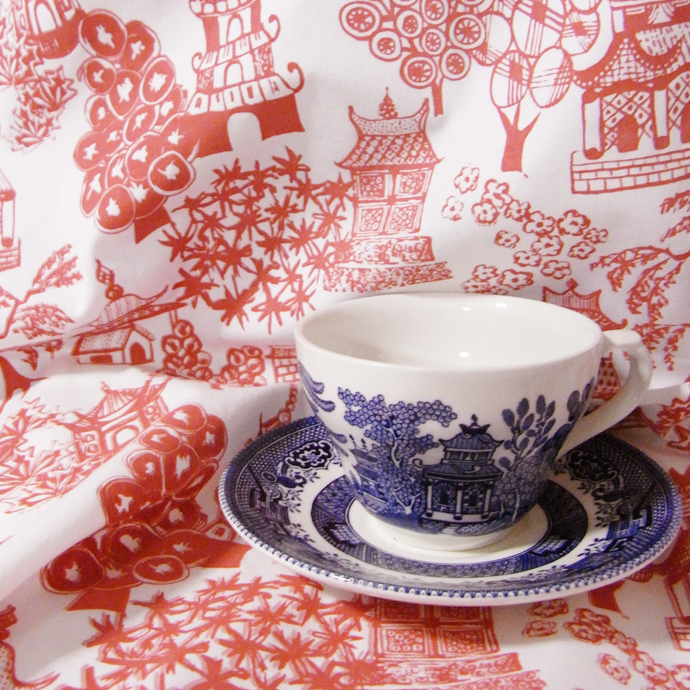 My latest collection of quilting/craft fabrics is based on the well-known willow pattern plates. I find them very interesting, as a tangible bridge between East and West. You see, they aren’t totally Chinese – the Art Gallery of NSW sometimes shows its collection of Chinese porcelain, made for export. It’s amazing how different each piece looks, depending on the place where it was intended to be sold. Many of the designs I wouldn’t recognise as Chinese designs at all! 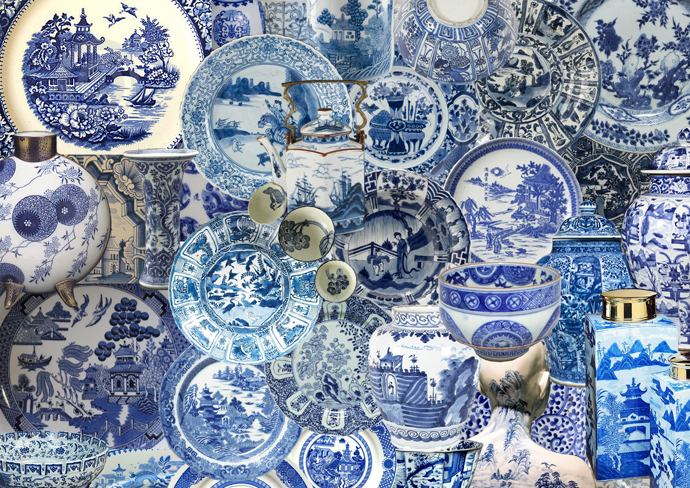 Then again, the willow pattern clearly isn’t a fully Western motif, either. In designing my collection, sometimes I was really literal, and re-drew my version of motifs from a variety of willow pattern plates, old and new; mine; my grandpa’s and some from my husband’s family. Sometimes I just took a tiny bit of a motif and made it into a tiny little plate … and sometimes I was just generally inspired by things fom China that I see every day, such as camellias. I love seeing behind the scenes, and understanding how a designer works. In this space, I’d like to share some of my design process with you. (I also share the pretty and not-so-pretty parts of designing and making on my Instagram). In studying textile design, we learnt both hand-done and computer/CAD techniques. Last year, I started thinking about the contrast between the two, and the way in which hand techniques mean no two items are actually, precisely the same. I was thinking about this as I rushed through Sydney’s Queen Victoria Building, and noticed that each side of the windows was slightly different, even though the overall effect of the windows is symmetrical and balanced. What is Ettie and Marion? 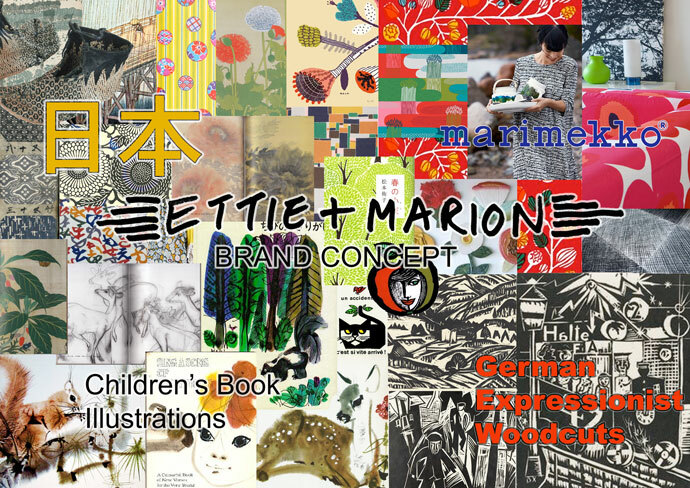 Ettie and Marion is a brand designed by me, Ginevra. Welcome to my new blog home! I’m a graduate year Textile Design student at the Fashion Design Studio (Ultimo, previously East Sydney, TAFE). We’re encouraged to think about the type of business we will launch on graduation. Because I have heard so much about the idea of a “brand DNA” in the fashion industry, I felt the needed to define my own DNA/brand concept. 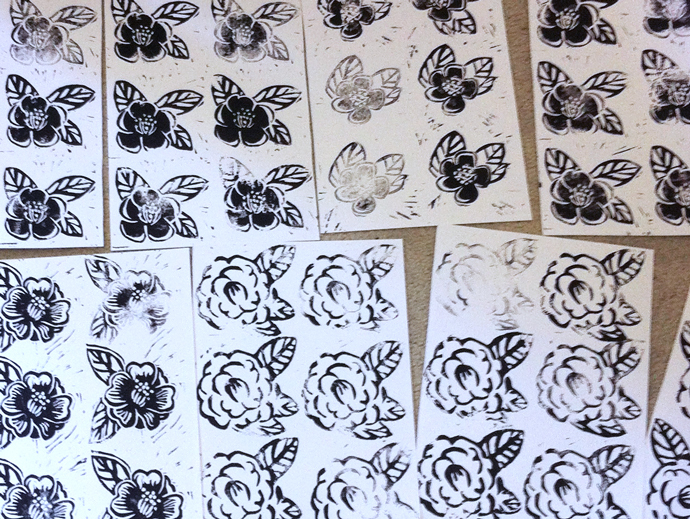 These are images that are now part of me, and they’re the basis of my design style. Whenever I work on a collection of quilting/craft or fashion fabrics, I return to these references and fall in love with them again.